Welcome to this week’s What I Ate Wednesday. I remembered to film and take pictures today. I just need to invest in new plates. They are from my University days so they must be nearly 15 years old! Something new today! Well not new for me but the first time I’ve shown it on my blog. I love these Nestle Clusters. They are bran flakes with almond clusters. I had this with fresh strawberries and semi-skimmed milk. 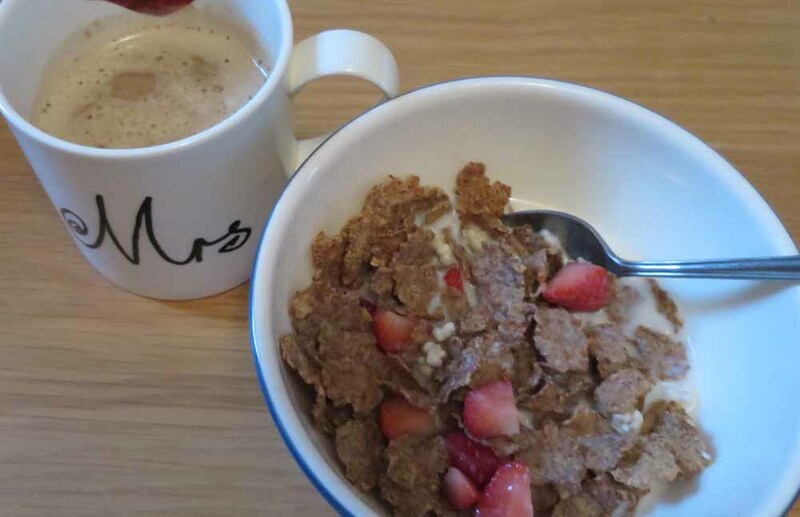 I also had my usual Nespresso coffee with hot Alpro soya milk. We went out for lunch today. I don’t always eat out. Maybe about once a week unless we have a takeaway. 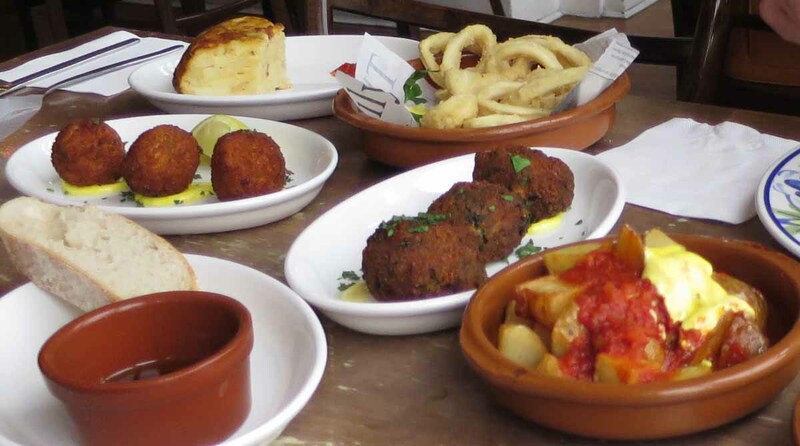 We were in town so we had Spanish Tapas at La Tasca. I chose Albondigas (pork meatballs), Croquetas de Pollo (chicken breadcrumbed balls), Patatas Bravas (fried potatoes) and a house salad. Andy picked Croquettas de Espinaca (goat’s cheese and spinach balls), Calamares (squid rings), Tortilla Espanola (egg and potato omelette) and bread with an olive oil and balsamic vinegar dressing. These were all from the La Tasca Set Menu. If I’m honest I didn’t really like the Tortilla and expected it to be a wrap of some sort. My mum kindly made us a Thai dinner. 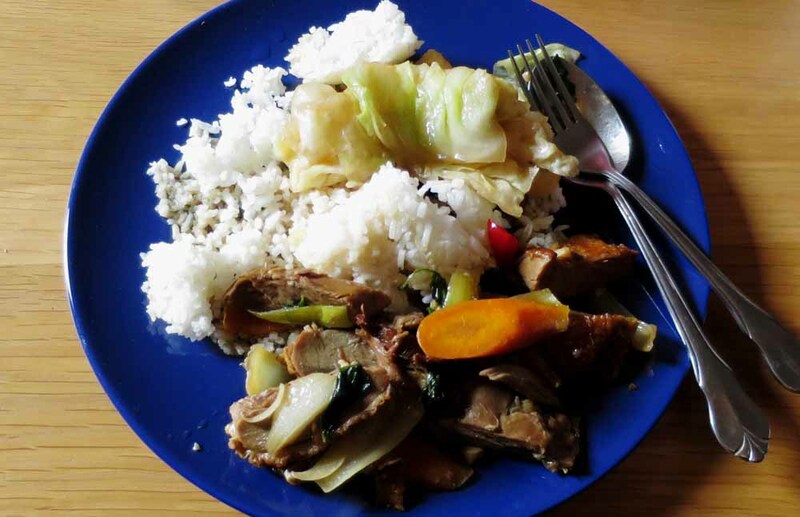 We had duck stir-fried with sweet basil, stir-fried white cabbage and boiled rice. It was better than one we could have ordered from a restaurant and it even came in a takeaway container! Heath was being a moan-y monkey this morning so I desperately needed a chocolate fix to cheer me up. I quickly polished off a Cadbury’s Dairy Milk. I also drank a flat white coffee from Lavazza. At home I was a bit naughty as I had another chocolate fix, it was a Wispa hot chocolate. As I mentioned last week, I am on a mission to lose my mum tum. I’ve had no weight change this week but I did weigh myself a bit later today. I normally weigh myself in the morning before breakfast but I had already eaten breakfast and a snack when I remembered that I needed to get on the scales. At least I haven’t gained weight. I’ve had a major fail for this week’s What I Ate Wednesday as I took one picture of today’s meals! I remembered to film…just, but all I have is this picture of breakfast. To make it up to you, I will do my best to describe what I had and I will talk to you about my diet and weight goals. This is the last time I will have this breakfast, I promise! 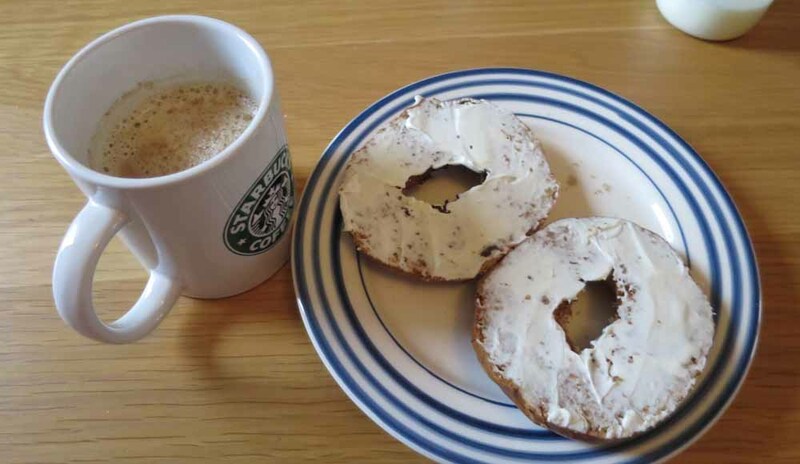 It was a New York Co Cinnamon and Raisin Bagel with Philadelphia cream cheese. No blueberries though as we ran out. I also had my usual Nespresso coffee with hot Alpro soya milk. I had a Ploughman’s lunch at the Carpenter’s Arms near Chew Valley Lake. I asked for a ham and Cheddar cheese mix as they normally have them separately. It was served with a pickled onion, salad, pickle, Granary bread, apple and tomato. It was very delicious. Oh, it also came with butter but I didn’t eat that as I only put butter or margarine on bread if I’m having jam or marmalade. I didn’t fancy anything too heavy as I had quite a big lunch. It was grilled peppered steak in a white tortilla wrap with a level dessert spoon of mayonnaise, rocket, watercress, spinach and tomato. 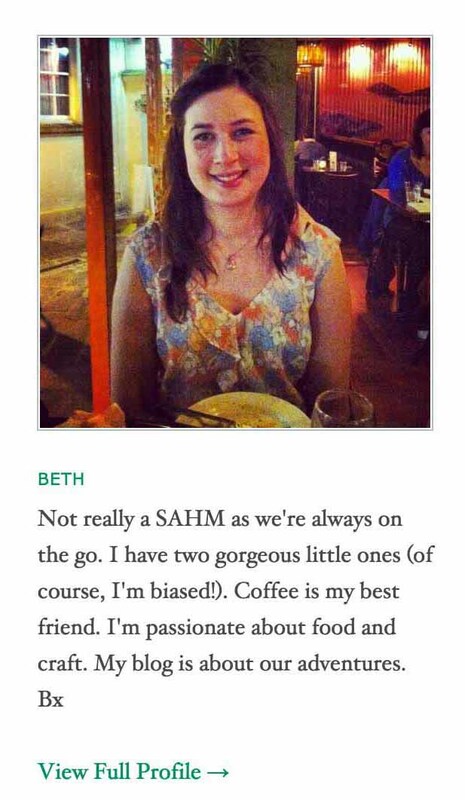 I had a flat white coffee from Salt and Malt (what a brilliant name for a fish and chip shop!) at Chew Valley Lake while I was watching Annabelle play in the playground and carrying Heath in the sling. I resisted the mouthwatering chocolate cake that was staring at me while I was in the queue. It took A LOT of willpower. So, as I mentioned earlier, I am planning on eating well to lose my mum tum. I’m not doing anything drastic as I don’t need to lose too much weight, I just need to tone and streamline. I’ve mentioned before that my stomach muscles separated during pregnancy and my physio has recommended gentle exercises like swimming and body balance to complement a well balanced diet. She did mention that if I did body balance that I would have to make sure the instructor could teach me alternative exercises to do while everyone else did the stomach crunches. Andy would like us to go to the gym together so we are looking into signing up to one this week. I’ve changed the types of snacks that I’m eating too and I really like almond butter on a lightly salted rice cake. I’m trying to have fruit instead of biscuits and apple crisps instead of Kettle chips or Pringles. I’m also making healthier choices when I eat out. It was really tough not to have the Aberdeen Angus burger with Stilton and to go for the Ploughman’s (and not eat all the cheese! ).